Quick recipes: an indispensable solution when you do not have time to prepare all the dishes we want. Some preparations become quick recipes because it does not require cooking, the other can make quick, and if you want the easiest, buying semi-finished products, such as ready-made puff pastry, or instant polenta. In classify my quick recipes I have not given the time at all, but rather the relationship between the little time it takes and the final result. puff pastry candy ham: a finger food tasty. The preparation is very fast and easy, the peculiarity is the closing of the pieces of dough as if it were candy. I am a tasty tidbit: the use of raw ham and brie cheese gives it a strong taste for this appetizer. For this reason, we should not overdo it with the filling. Who then wanted a more delicate flavor can use cooked ham and Emmental. Also perfect for a starter, alongside pickled meats and vegetables. cut the brie cheese into large pieces. Unroll puff pastry and cut it into squares. We'll have to get 12 squares (or rectangles). Put at the center of each square a little ham and a piece of Brie. Close them, one by one, folding them in two, and rolling up the two outer flaps forming a bundle in the shape of candy. Transfer all the candy in a baking tray lined with parchment paper. Making cuts with the tip of a knife on the outer edges (bows candy) so as to favor the rising. Beat the 'egg with a brush and brush the surface of the candy. Store them in the fridge to rest until ready to use them. NB: When the puff pastry is Cold leavens better. Preheat oven to 180 *. inform pasta candy puff and cook for at least 15 minutes. On the surface it will form a golden crust. serve the candy puff pastry with ham per couple lying them on a saucer. Each diner may use a saucer. Artichokes and potatoes: a simple and easy side dish. Potatoes are steamed to retain their good taste and artichokes, finely chopped purposes, they are quickly stir-fried. When we taste this dish feel distinct flavors of the two vegetables that still look great together! Steam cook for 30 minutes. NB: The potatoes must remain compact and crisp. While the potatoes are cooking clean the artichokes. Remove tough outer leaves and the tips. Cut the stem at the base of the artichoke. Also clean the shank eliminating the external part and holding the central part. Cut the artichokes in half and wash them. Soak them in a bowl with water and lemon juice. Cut the artichokes into thin slices and the stems into rounds. Clean and wash the parsley. Chop. Once cooked, the potatoes, remove from the steamer basket. Add salt and pepper. Put a pan on the stove with a little oil and a small knob of butter and put to cook the artichokes, adding, if necessary, a little water. Season with salt and pepper. Add the cubes of potato steamed. Stir and cook together again for a few minutes to mix the vegetables. The outline with cannellini beans and cherry tomatoes: a great combination. Often, at the last minute, we decided to bring to the table the beans: good and high in fiber. The fact of being able to buy already cooked, canned, making them a good side dish for all occasions, economic and fast. In fact, at times, it needs very little to turn it into a full dish to taste. In this case the addition of cherry tomatoes datterini sweet and a good shallot, transform this outline, from the simple opening of a can of beans, in a plate entirely different. And the preparation time is still very little! Clean and wash the shallot. Slice it. wash datterini tomatoes and cut, one by one, in half (in this wither way better and release a good sauce). Drain the cannellini beans of the box and quickly rinse under running water (in this way we clean them of preserving liquid). Clean and wash the rosemary. Chop finely. Put to heat some oil in a pan. add the shallot and cook it. Add the tomatoes and reduce heat. To soften the datterini tomatoes stirring with a wooden spoon. After a few minutes the tomatoes to release some of their water vegetation that will begin to form a delicious rosé sauce. Add at this point also the cannellini beans and mix. Amalgamate tomatoes and beans together for a couple of minutes. Bring to the table hot Garnish with cannellini beans and cherry tomatoes. Crackers with philadelphia cheese and pears: a fresh snacks and fast, also perfect as an appetizer for a summer dinner. The combination of cheese with pears is a classic; the addition of dried fruits such as almonds gives a taste extra note. I find them to be perfect. Put the cheese in a bowl and knead with a fork to soften it. Add the chopped almonds and mix with cheese. Spread the mixture of philadelphia cheese on crackers and almonds until exhaustion. Transfer the snacks thus obtained on a serving dish. Just before serving, drain the pear dall'acuq and place a slice on each cracker. Spread the mixture on serving them little plently of crackers to prevent soften and lose crunchiness. 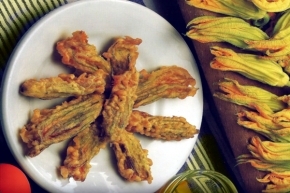 The fried zucchini flowers are a classic Italian cuisine. Often, before being fried, are filled in various ways, according to the tradition of the various regioni.La recipe that we propose here provides that the flowers are simply passed in batter, without filling. To add this batter is also perfect for frying other vegetables, such as tomatoes, zucchini, eggplant. To prepare the batter must be put in a bowl the flour, salt, pepper, a sprinkling of nutmeg, 3 tablespoons of olive oil and an egg yolk. Dilute everything by putting water and wine in equal proportions until the mixture is quite liquid. Clean courgette flowers eliminating the stem, green outer leaves and the pistil centrale.Fare attention to keep the flower indoors. Put plenty of oil in a large frying pan and heat it well. When the oil is high in temperature, pass courgette flowers in the batter, drain the excess and fry for elimarne. Serve piping hot fried zucchini flowers and crispy. I courgette flowers They must be firm and fresh. I courgette flowers that are used are not those that are commonly found attached to zucchini. Courgettes have two types of flowers: female ones on short stalks that become zucchini and male ones with stems much more subtle and long that they never grow zucchini. The latter are usually collected to be used in the kitchen. The recipe for Cheese First Sale (or primosale) with vinaigrette with herbs is a great idea for a side dish or a light entree but full of flavor and scents, ideal for summer! Wash and dry your herbs making sure to remove the withered or stained parts. Chop the herbs in average way. Place the chopped herbs in a small bowl with the olive oil and the juice of a lemon wedge. Stir gently and, if you want to add a pinch of salt and pepper, leave to steep for one hour. portioning the Cheese first salt on plates and cover with the vinaigrette of herbs. Serve the first cheese Salt with herb vinaigrette as an appetizer or as a side dish from a flare. You can choose between various types of first salt cheeses, or even fresh lean cheeses, or if you also prefer cow's milk goats. The mix of herbs is free, it must pay attention to the quantity and the aromatic potential of each grass: I have put a few leaves of mint because altirmenti would cover the other, and that's why I did not put sage and thyme. And 'essential oil: here is the case of using a good quality extra virgin olive oil. Given the herbs I recommend a Ligurian or a lake Garda oil DOP. The caprese salad is probably the first recipe that comes to mind to prepare the summer. Excellent as a main dish, but also as an appetizer. It 'easy and really quick recipe: for this is the fastest way when you just do not know what to cook. And is available to everyone: those who have no home in mozzarella and tomato? I use, as usual, Vesuvian tomatoes. Essential is the use of fresh basil. Drain the mozzarella cheese from the storage liquid and cut into slices of the same thickness of the tomato. Wash the bunch of basil one and unscrew the leaves. Put in a plate of slices flow tomato, Alternating with those of mozzarella cheese. Add a leaf basil on each slice of mozzarella cheese. Add salt, sprinkle Condell 'Origan and seasoned with extra virgin olive oil. If you like to be a little cold (especially when it's very hot) let it rest for half an hour in the refrigerator before serving. Clean mushrooms and wash them under running water. Clean the celery eliminating the outer filaments. Wash.
cut the Grana Padano flakes using a vegetable peeler. compose'Mushroom salad, celery and grana padano on the serving dish by placing a first layer of mushrooms, A subsequent layer of celery and complete with flakes Grana Padano. Season with salt, pepper and extra virgin olive oil to taste. Panzanella is a real traditional dish from Florence, has spread throughout Tuscany since the beginning dell'800. It 'a summer dish, poor and humble, that does not require cooking. Its origin is rural: this dish was consumed in the fields by those who, for work, remained outside the house all day. It 'a pact made with bread, but only Tuscan bread (bland). The bread must be stale: panzanella is therefore also a useful recovery plate. Initially, only dressed with red onion, over time has seen the addition of tomatoes, cucumbers, basil. It is understood that, just because it is a well recovery dish, is my habit to enrich it with capers, olives, tuna, .... or whatever else we find available in the pantry. We move away from the traditional recipe, with a quick recipe, but we get a personalized taste. Peel and wash the onion. Wash tomatoes and cut them into small pieces removing the seeds. Gather the tomatoes in a bowl toss with a little salt and oil. Stir and leave to marinate for half an hour so that pomdori release some liquid. Peel the cucumber and cut even this thin rounds. Take the slices of stale bread and matterle in a covered pot of water and 2 tablespoons of vinegar. NB: The bread can be, or not to be deprived of the crust. Personally I prefer to keep the crust. When the bread is soaked (but not "undone"), drain and eventually squeeze, if it eccessivamene soaked, to remove a bit of water and vinegar. In a large bowl, which will contain all prepoarazione, chop the bread. Cover it with tomatoes left to marinate. Then a layer of cucumbers and complete with onion (drained from the water). Wash the basil leaves and sezzettarle preparedness. Season with salt, pepper and abbondane olive oil and stir to mix the ingredients well. Refrigerate for at least an hour and remove only the momentoservire. And 'in fact a dish best eaten cold. These straccetti of beef with balsamic vinegar rocket and Parmigiano Reggiano cream, are a refined variant of the classic beef straccetti. The most complicated part is making a cream with the right consistency by melting Parmesan in milk or cream. Toelettare the slices of meat off any ribs or unwanted fat. Cut the meat into strips about one centimeter thick, if you are too long, cut them in half. Flour well the strips of beef. Wash and chop the rocket salad. Put on high heat a pan with extra virgin olive oil. Heat in a small saucepan (the kettle for milk may be fine) milk or heavy cream if you prefer a more creamy taste. cook you make strips of beef floured, stirring occasionally. Once the milk is hot, before it begins to boil, add the grated Parmesan cheese, a little at a time and mix. Continue to add the Parmesan and stir until it reaches the required consistency. Add the arugula with rags at the end of cooking, add salt and pepper and sprinkle with a few drops of balsamic vinegar (Increase the amount of vinegar if the quality is not high: with balsamic vinegar Traditional from Modena or Reggio just a few drops). pour parmesan cream cheese mirror on the bottom of the dish, then Serve the rags. serve strips of beef with balsamic vinegar, rocket and parmesan cream adding, if you like fresh rocket whole or chopped.